Perforated angle has 1/4" holes, centered and spaced 1" apart. This is the main building block of the Contraptor set. The angle is used as a structural component and as a linear rail for sliding elements. 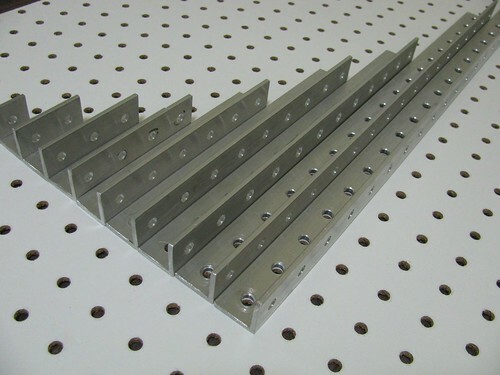 Quarter-inch holes, used in the set with smaller 10-24 screws, allow small adjustments at the time of assembly, which makes the design tolerant to errors. The raw aluminum angle stock needs to be turned into perforated angle, however it's too time-consuming to do all at once. Only a few holes per piece are required for any given project, so it's recommended that the drilling be spread out over time as different contraptions are built from the set. To make drilling as-you-go easier, the hole locations are center-punched on the angle, which is significantly faster process than drilling. If you have a drill press and don't mind spending the time to drill all of the perforated angle upfront, it can also be done, using a simple jig. After all angle is center punched, it is sawn into pieces of required lengths. An angle piece is actually shorter than the whole number of inches by 1/16", i.e. 1" piece is 15/16", 2" is 1 15/16" etc. These are the lengths resulting from sawing longer piece of perforated angle into shorter ones, 1/16" being the kerf. It's convenient as it makes the ends of the angle a bit shorter so that they don't stick out beyond the angle footprint on 1" grid. In 3D models, on the contrary, angle lengths are whole numbers of inches - this is done so that different parts snap to each other easily during modeling. This is the standard method of making Contraptor components described in Howto section. It is fairly slow for making perforated angle, but can work if you do not have pegboard and need to make just enough angle for the corner jig. With this process you can center punch a bunch of 2-ft blank angle pieces, one side at a time. A pair of starter holes is needed on each end of each blank piece. The starter holes can be made using paper templates (see Howto). The distance between the holes on different ends should be 23". Make sure your pegboard is accurate! There is usually small error in one direction and larger error in the perpendicular direction. If your angle is 24" 1/4 instead of 24", you'll have all kinds of problems, for example you won't be able to fit the belts! With this process you can center punch both sides of a blank angle at a time. Corner jig is assembled from three perforated angles of the same length as the punched blank. You can also use the corner jig as a template for sawing angle as well as drilling it on the drill press.